451 Research cited us as an early entrant to the integration Platform as a Service (iPaaS) market, and noted that our mature platform has a broad and growing base of customers. They also noted that we have high renewal rates and low churn. 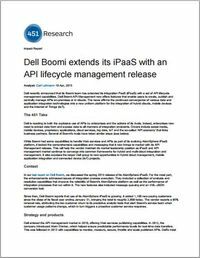 Dell Boomi extends its iPaaS with an API lifecycle management release.